Mammoth skeleton. 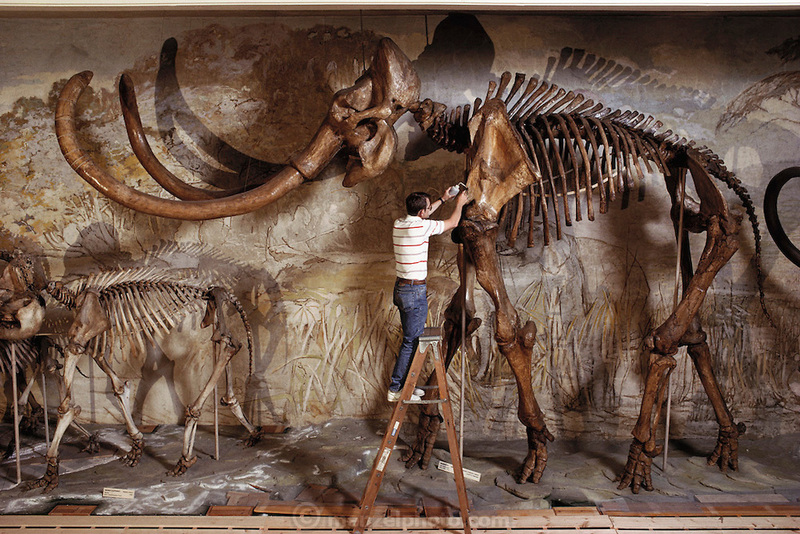 Side view of the largest mounted Mammuthus columbi skeleton in the world. It is housed at the University of Nebraska State Museum, USA. At upper left are giant up-curved tusks. This specimen is 4 meters in height. Mammuthus columbi (Columbian mammoth) was a giant elephant-like mammal, which roamed temperate parts of North America more than 10,000 years ago, when it became extinct. This species was an important later relative of the woolly mammoth of Europe and Siberia. These well-preserved bones of Mammuthus columbi were discovered in Lincoln County, Nebraska, in 1922, a site famous for its fossils. The skeleton was assembled in 1933. 1992.